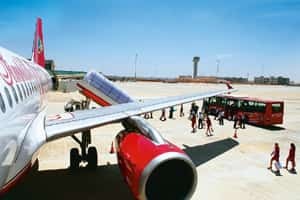 Bangalore: Bangalore International Airport Ltd, or Bial, the operator of the tech city’s new airport, deferred its expansion plans and slashed its passenger estimate by nearly a quarter as a global—and Indian—economic slowdown and increased domestic fares dent traffic. Bial chief executive officer Albert Brunner said the civil aviation ministry not granting it permission to charge passengers a user development fee, or UDF, and a decline in the number of flights had contributed to the delay in expansion plans. The expansion plan, which includes another terminal and a second runway, involving an investment of ₹ 4,000-5,000 crore, would take four-five years. “At present the terminal we have is sufficient for another two years," Brunner said. Bial had planned an interim low-cost terminal before it embarked on building the second terminal and runway, but with the slowdown, it plans to take a decision in three months, based on the results of a study it is conducting. Bial, which opened in May, now expects to handle 9.2 million passengers by March, compared with the 13 million it had forecast at the time it opened for traffic. Four million passengers have used the airport so far. The pace of India’s economic growth has slowed since the airport’s inauguration while major economies are headed for recession in the wake of the financial industry turmoil that spread from the US. Loss-making domestic airlines increased fares to counter a steep rise in jet fuel prices earlier in the year, also hurting passenger growth. In October, Bangalore saw passenger traffic dip to 712,000 from 832,000 a year ago. The latest forecast indicates that Bial will handle fewer passengers than the 9.8 million handled last year by the HAL airport, which was closed for civilian flights after the new facility opened. An analyst said Bial may have factored in a slowdown for the next two quarters to arrive at the new passenger estimate. Kapil Kaul, India head of the Centre for Asia-Pacific Aviation, said while there has been a capacity reduction of nearly 17% in the first half by airlines, another 10-15% cut may take place in the latter half of this fiscal. The slowdown is likely to affect almost all airport operators as “capital is drying up" and so is passenger traffic. “The second phase of expansion will take a hit," he said partly blaming the government for not setting up an airport regulatory body for monitoring charges such as UDF. A contract called the concession agreement between Bial and the Union government signed in 2004 mandated the closure of the HAL airport for commercial operations once the new airport opened. Citizens’ groups in Bangalore have gone to the courts against the closure and also alleged that the new airport had not been built to handle the expected increase in passenger traffic. Bial is a consortium that includes Siemens Project Ventures GmbH, a German infrastructure company, Larsen and Toubro Ltd, India’s largest engineering company, and Unique Zurich Airport, which operates the international airport at Zurich, Switzerland. Airports Authority of India and the Karnataka government hold 13% equity in the project. The firm claimed it had invested Rs2,470 crore in the project, but an audited report submitted last month to the directorate general of civil aviation put the project cost at Rs2,216 crore. PTI and Mint’s Tarun Shukla contributed to this story.